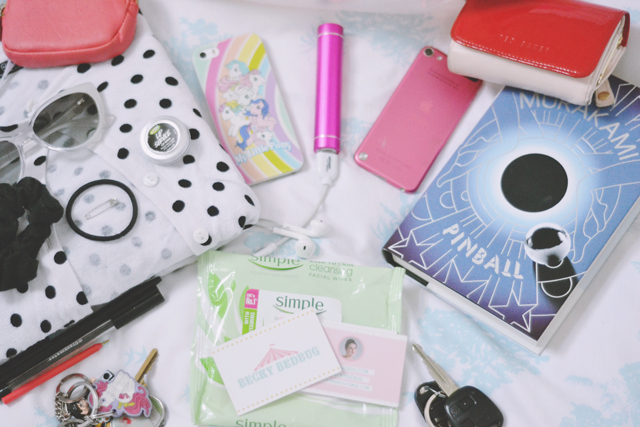 I love reading What's in my bag posts, and I know I'm not alone. There's something inately curious (or just nosy!) about all of us that means we love peeking into other people's handbags. Luckily for everyone I ever cross paths with at the moment, the newest addition to my bag collection is transparent, so they can all have a snoop! 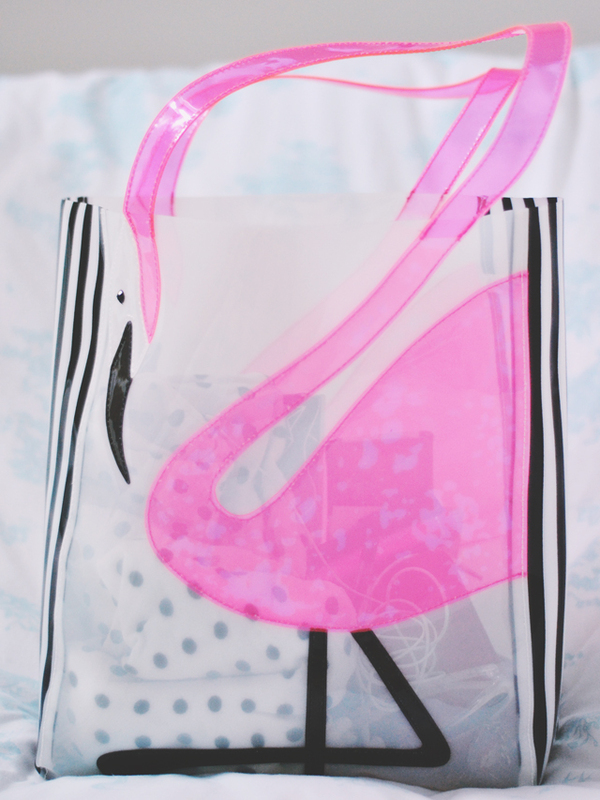 Admittedly, I think this flamingo bag from House of Fraser is designed as a beach bag since it's made of flexible, waterproof plastic, but it's just too cute not to use more often. Look at his cute little beaded eye! And his handle-neck! Besides, he's a flamingo! 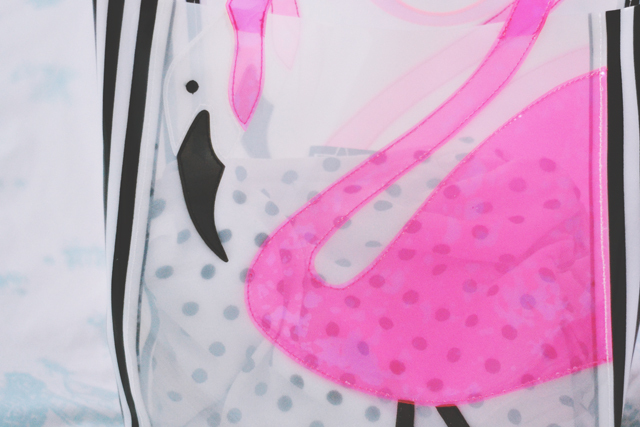 Bloggers love flamingoes! I like to think I'm quite good at sticking to the basics. If you need some aspirin or a plaster, I'm not the person to ask. My bag contains only the essentials. However, the bonus of having a bag that's slightly bigger than I'm used to means I can pack some additional items just in case. 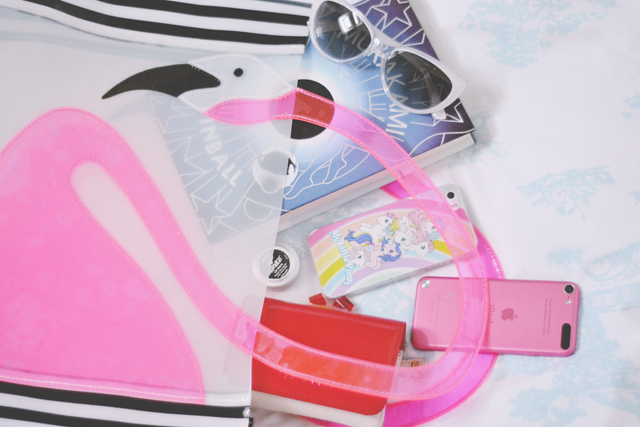 Right in the top left-hand corner you can see the most important item in my bag- my PPOW (Pink Pouch of Wonder). In here I keep two spare camera batteries and a spare SD card. I'm not going to admit to how many times I leave the house without a charged battery or SD card (or both!). Suffice to say, it's a lot and I'd be completely lost without my PPOW! Then I have my fashion and beauty essentials: A cardigan in case I get cold, a scrunchie and hair bobble, lip balm, sunglasses, MAC Bombshell (which evaded the photo) and some make up wipes. I also have a safety pin for some reason which has secretly smuggled itselt onto three flights in the past couple of weeks. When I wass 14, airport security confiscated my nail file, so I'm not entirely sure how a safety pin made it through three times! In the middle are my technical items: iPhone (yes that is a My Little Pony case), iPod, earphones and my portable charger which, like my PPOW, is indispensable! House keys, car keys (have I mentioned I can drive now?) and my purse go without saying but I also carry business cards everywhere I go. I hardly ever need them, of course, but it's always when I don't have them that I need them! Same goes for my three pens. Do I need three pens? Probably not. Did I know I had three pens in one bag? Not at all. The best thing about a larger bag? It can hold my books. Hooray! Murakami, of course! Oh, it's just so darn cute! Huge thanks to House of Fraser for sending me Mr Flamingo. I like your smuggled safety pin- the last time I went away I walked a bottle of water and carton of juice through Egyptian security. Although I got stopped and my bag searched both ways in the UK. I keep pulling random stuff out of mine, like socks, ikea pencils and a bag of ginger this week! I do love a good nose in peoples bags/wardrobes/bookcases. Your bag is so different to mine! Gorgeous, but very different. You carry the necessities, I carry everything that's on my face, a few snacks, several notebooks and around 50 emergency hair bobbles. I love this bag, it's SO cute. I hate ending up with random stuff in my bag so I try to keep it organised but it usually does end up with random stuff in it. 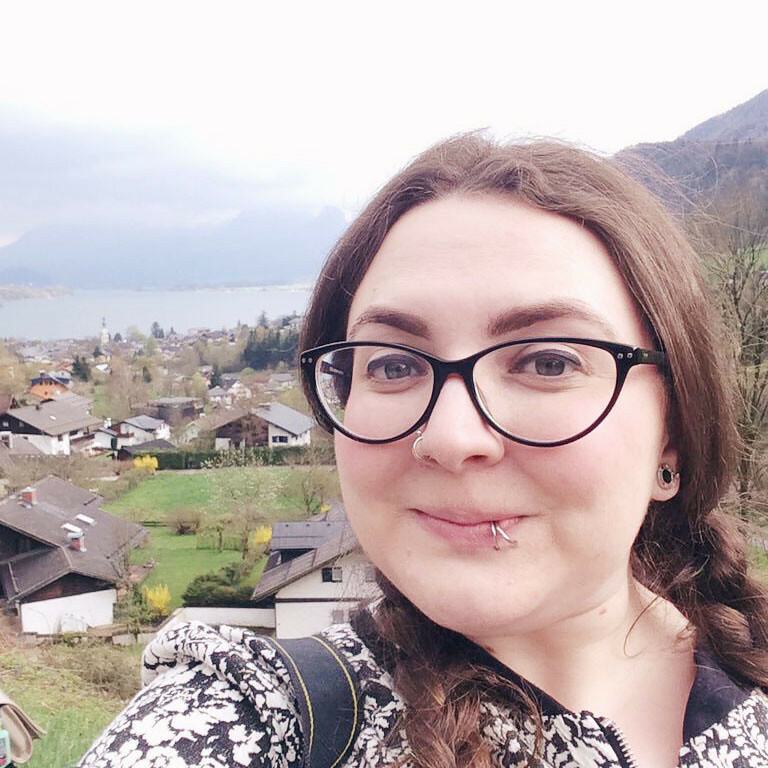 I try to only carry around the necessities as well, I have tried in the past to keep things like paracetamol and plasters etc., but once they run out I can never be bothered to replace them! This bag is amazing, give it to me!